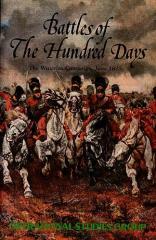 Hundred Days Battles is a strategy game for two or three players which recreates the climax of the Hundred Days Campaign. The division sized units of both sides are represented on the map by leaders who command their corps and army formations. Leaders march, force march, and influence combat according to their individual abilities. Combat is resolved by rolling a die on the Combat Results Table. To win, the French must exit units off the map towards Brussels, or destroy the Allied armies. The Allies win by preventing French victory.